Developed by Australia’s largest privately owned development company, Grocon, Liberty Place is a commercial office and retail development that was conceived in the midst of the global financial crisis. Liberty Place links Pitt and Castlereagh Streets in Sydney’s mid-town and includes the restoration of the heritage listed Legion House. The precinct offers superb facilities and the location provides a vast array of amenities and recreational pursuits in the near vicinity as well as being conveniently close to all forms of transport. 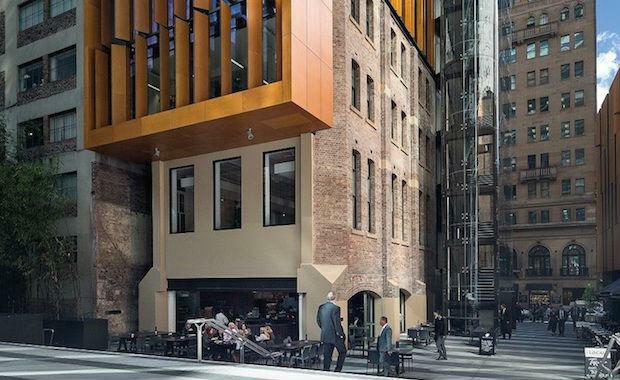 with 1,200 square metres over 5 floors and 167 Castlereagh St.
with 360 square metres over 2 floors. Five restaurants, a bar, café and a fashion retailer have also been brought to life in the precinct. The development is the product of an architectural vision driven towards positive outcomes for the community through the public domain interface including a strong emphasis on creating new public spaces, an interesting urban form, public art and community awareness through the accommodation on a rent-free basis of the St James Ethics Centre within the development. All three commercial buildings were completed in early 2013 and boast a 6-star Green Star Office Design. Grocon’s development at Liberty Place has been recognized by the Urban Development Institute of Australia (UDIA) for national excellence in sustainable development. said the Liberty Place precinct embraced sustainable development principles from the outset with ANZ Tower and Legion House both achieving the highest possible 6 Star Green Star design rating and Legion House meeting the ASBEC definition for Zero Carbon Building, an Australian first for a refurbished building. “We had a bold vision for this project right from the get-go. We wanted to push boundaries with new technologies and demonstrate that carbon neutrality can exist in functional and beautiful commercial buildings,” she said. Façade - The façade achieves very high standards through double and triple “Low e” (low emissivity coating) allowing high visibility glass but retaining the “shading coefficient” advantages of darker glass. The infrastructure within the development has the ability to produce its own fuel from biomass gasification. This technology converts biomass (plant sourced) materials to a combustible gas that is used to generate electricity. This is a process very much like a slow combustion stove, but instead of burning the gas it is piped away to the generators. Initially Legion House will be powered by plantation off-cuts to ensure native forest resources are not consumed. The adjacent ANZ Tower and retail development will provide a variety of waste material to power Legion House. The waste, including paper and cardboard, will be sorted, shredded and compressed into briquettes that are the “feed stock” for the gasifier. Special generators were manufactured specifically for the project in Indiana (USA) in order to run on dual gases – natural gas and bio-gas produced from the (biomass gasification) gasifier system. The heritage listed Legion House has been refurbished as a fully zero carbon building creating its own renewable electricity on site resulting in zero net carbon emissions. The tri-generation system incorporates two 420kWe gas generators and two 317kWth absorber chillers. chilled beams to the façade areas and VAV system for the internals. Balancing energy performance with industry preference for VAV systems. 98% of construction waste was recycled rather than end up as fill. The site has a rich history and was the home of the Sydney Horse Bazaar from the 1860s. Legion House was a hostel for women for 60 years from the early 1900s and it was this history which inspired the precinct’s name Liberty Place. Liberty Place is owned by The GPT Group, ISPT and LaSalle Investment Management.